Welcome to leaguE-talk! This podcast is focused on Esports and more specifically League of Legends. Content is uploaded twice a week with one podcast based on sports coaching, psychology and science and the other is a podcast with a guest which has included; Coaches, Managers, Players, Psychologists and much more! Tune in to improve your ingame play or learn more about the game and industry! leaguE talk #50 - Q+A - How best to make it onto an Esports Team! Being the Best Teammate, Branding and Improving Game play. leaguE talk #48: Visualisation - BE BETTER AT LEAGUE THROUGH VISUALISATION! - How to Visualise effectively and tips to stay on track! LeaguE talk #46 - The Importance of Sleep, Use sleep to improve you LoL performance - GO BACK TO BED! On this episode of leaguE talk we go into detail as to why we should be trying to get our standard eight hours of sleep. A really interesting episode for me to find out and research about. I truly believe that making sure you get a solid 8 hours of sleep will improve so many different aspects of the game; from mental fortitude and positivity to actual performance such as speed and accuracy. If you enjoyed this or have any feedback whatsoever let me know and get in touch at @leaguetalkshow on Twitter! Have a wonderful day! Episode 45 brings Enclaves own jungler, Wysek. In my opinion Wysek and Warsi have been the best Jungle, Mid duo in the UKLC and have had a brilliant split together with a lot of promising plays coming from this. In this episode Wysek and I go over Enclave, what is like playing in the UK scene, communication and having English as a second language, The different regions he has played in, weighing in on the classic meta vs comfort debate as the Kindred man himself, Talent and hardwork and the split with Warsi! Wysek was a wonderful guest so if you would like to find him follow the below links Twitter - @wysekelite twitch.tv/wysek1337 If you enjoyed the episode get incontact! Find me at @leaguetalkshow on Twitter! My first ever VOD review! If you enjoyed let me know, any feedback is appreciated - @leaguetalkshow on Twitter and @league_talk on Instagram! Counter Logic Gaming's Academy team played against Team Liquids academy team in the Quater finals of the playoffs! A true clinic on how to counter jungle. My first ever vlog!! If you enjoyed or have any form of feedback it get in touch on Twitter - @leaguetalkshow In this vlog I show you my Sunday from start to finish! This is pretty much a standard Sunday for me obviously swapping in and out some of the events on occasion. We got up at 6.30am and smashed through a bunch of work until going for a run and using the gym for leg day. Went to a Wellbeing fair, some food and then to the Talk show 'the splash zone' at the end of the day! A great day so hopefully a bunch can be learnt from this! leaguE talk #40 - How to Avoid and Recover from Tilt; A Focus on the Now - What is tilt and where does it come from? Focus on winning from NOW. In game and out of game recovery techniques. leaguE talk #39 w/ Tom Daniels - Narrative! - Esports Journalism, Creation Process, Journalism as a Skill, The importance of Narrative, UKLC, and Audio and Video versus Written Content. leaguE talk #38 - Burnout: What is it? Why is it so Detrimental? How to tackle it and Future Proofing! In this episode of leaguE talk we go over the sheer importance of repetition. Listen in to understand how sports psychology, science and coaching techniques can be applied to league of legends in order for you to aid your ranked climb! I'd love to keep doing the Q+A segment so message in your questions below or to @leaguetalkshow on twitter! Let me know what you thought of this episode! would appreciate any feedback! Shogun, a UK professional league of legends support, came onto the podcast to discuss a wealth of interesting topics. These topics include how he thinks the LVP are doing and what this upcoming split will look like, What being a Support player is like and how practise can be extremely difficult, how the LEC is doing and his opinions on the current state of the game. A huge thanks to Shogun for giving his time for this podcast and discussion. Shoguns Socials Twitter - @UKshogun My Socials Twitter - @leaguetalkblog Youtube - https://www.youtube.com/channel/UCoSN4PQzK3Lm1GU-Apid9-w Instagram - @league_talk Side note; my upload schedule has now changed and my solo podcasts are now being released on a Sunday and the Guest appearances will be on Wednesdays as I think this is better for the upcoming split. 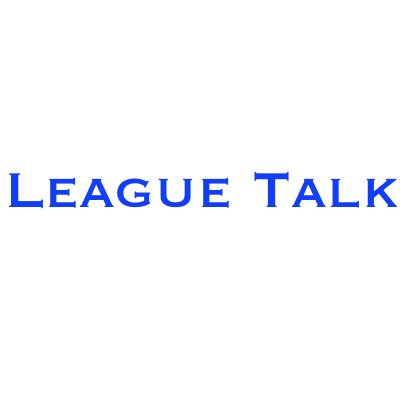 leaguE-talk #20 - E-sports aren't sports? A discussion we have had to many times. leaguE-talk #19 w/Jon Ellis - exceL Performance coach, the LEC, Player Screening and 10 man rosters. Shikari, Misfits Academy Top Laner appears on this weeks podcast and gives some valuable insight to regional leagues especially in the UK, how a coach can grow and gain respect, what he is looking to do to improve over the pre/off season and his opinions on Scouting grounds and the current pathway to pro. leaguE-talk #5 - 5 Top Tips from a Sports Coach to gain LP as the ranked season comes to an end. In this episode of leaguE-talk I discuss quantity vs quality in regards to practise. We see how the Afreeca Freecs practise and look into how that HAS to differ when looking at traditional sports. Instagram - @league_talk. Twitter - @leaguetalkblog Please do get in contact if you listen to this and let me know your thoughts! leaguE-talk #2 - What makes the main regions fail and succeed? League Talk #1 - Mastercard, Business of Worlds and Coaching through losses.